No one has said that having a horse is all play and no work. The novice often has romantic notions about riding through meadows with the wind streaming through the horse's mane and the sun shining brightly as rider and horse pause for a drink from a rushing spring. Without sufficient exercise horses tend to store pent-up energy and become less manageable. Yes, experiences like that may occur, but when it comes to actually owning and caring for a horse, the day-in and day-out facts of life apply. Horses need to be fed at least twice a day; they need a continual supply of fresh water to drink; and they need a minimum of 30 minutes exercise a day to maintain optimum health. Fortunately, with proper organization, some timely research, and a go-getter attitude, caring for your horse's basic needs can be an enjoyable break from the every-day world. Think about your work and daily life schedule and allow time for these three important tasks each and every day. Feeding and checking on the water supply can be done first thing in the morning and again in the evening. If you have a schedule that allows you to spend some time with your horse mid-day, that is a great time for providing exercise, working in a third feeding if you can do it consistently and checking that water supply. Whatever works for you, will most likely work for your horse. Be as consistent as possible in the time for each task, and remember, if you have to miss a day or two for whatever reason, it is extremely important that you get someone to step in and take care of the horse's needs for those times when you cannot do it. Horses usually wake up with an appetite as you will see when you approach them first thing in the morning. Feed is very important to horses since nature designed them to spend much of their day grazing, chewing, swallowing and digesting their feed. Most horse nutritionists recommend splitting the horse's feed into at least two or more feedings each day, usually first thing in the morning and then again in the late afternoon or early evening depending on your schedule. Use a feeder when feeding your horse. It doesn't have to be fancy, but should keep the horse from eating directly off the ground and ingesting sand or other indigestible matter that might cause colic or poor absorption of feed. As an alternative to using a feeder, you can also feed on stall mats to reduce the amount of sand ingested. 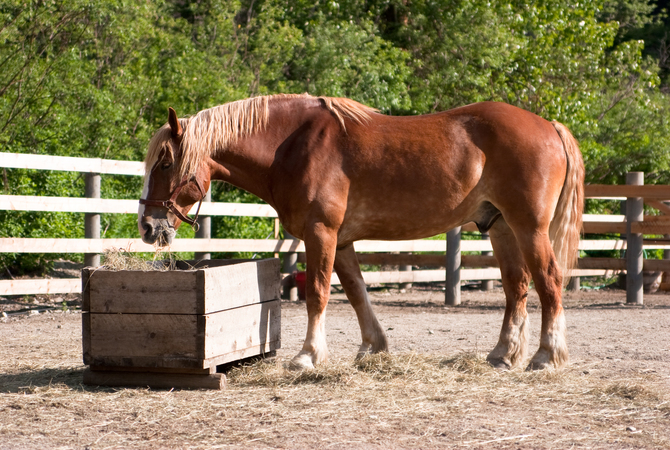 A barrel with a side cut out, a self-constructed hayrack or a commercial hayrack purchased at a feed store are some options you have when choosing how to feed your horse. Your horse should also be provided with a salt mineral block that can be licked to obtain salt and other minerals. Check your horse's water supply at least twice a day -- morning and evening. Horses should have a continual plentiful supply of fresh, clean water for drinking. The average horse drinks 8 to 10 gallons a day with minimum exercise. During hot weather or increased exercise, more will be necessary. Automatic waterers are available for use in stalls, pastures, barns and wherever the horse might need a drink. Manually filled water troughs are popular especially when several horses are drinking from the same supply. In all cases, the water should be clean and free from algae or debris. During cold weather where temperatures go below freezing, use of a heating element to keep water from freezing may be necessary. Your third daily task involves making sure that your horse gets at least thirty minutes of exercise. This can be riding, longeing, or walking, but should be of sufficient duration and intensity to give the horse a good work out. Without sufficient exercise horses tend to store pent-up energy and become less manageable as time goes on. Some horses turn to stereotypies such as stall walking when they don't have sufficient exercise. When choosing hay use the sight, smell and purity test: Do you see plenty of leaves as opposed to rough stems and is the hay a pale greenish brown? If the hay is mostly stems and is dark or black in color, don't buy or use it. Does the hay have a pleasant smell? Hay should smell fresh. Moldy or too dusty hay should be avoided at all costs. Does the hay consist of just hay or is it full of sticks, weeds, rope, foreign objects or other debris? If so, it's not worth the time or trouble and your horse's health would suffer in more ways than one.